Blogging has brought me a lot of good things in the past ten months: new friends, work contacts, a sense of community, inspiration... Well screw all that because now it has brought me new shoes. The Timberland Earthkeepers range features rugged boots made from extensive recycled materials such as Green Rubber from recycled car tyres and PET from plastic drinks bottles. Once you've eventually worn out your Earthkeepers, simply give them back to Timberland and they'll recycle up to 50 per cent of their components. I was offered the chance to try out any boots from the range; meaning subsequent days spent trying to decide on a pair. 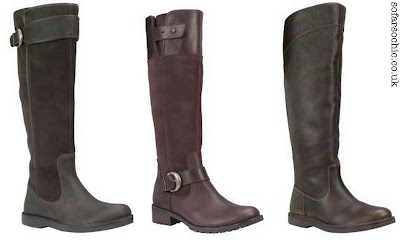 I finally settled on the Bethel Buckle Tall Zip-Up Boot in burgundy (middle). I like the fact they're chunky, an unusual colour and also the mixture of textures. I was very keen on the Cabot Pull-On Tall Boot (right) and the Cabot Tall Buckle Boot (left) as well but in the end I opted for the Bethels because their smaller calf width is better for my slim legs. I cannot wait to stomp around in the autumn leaves with my new boots on! I know I'm a lucky girl. Do you think I made the right choice? Actually, I'm not sure I want you to answer that. You'll throw me back into turmoil!